Festus’s eyes had followed me for days. They stared at me as I walked up the street, and when I left the front gate. His eyes were on a poster, placed on a street lamp directly outside my house. 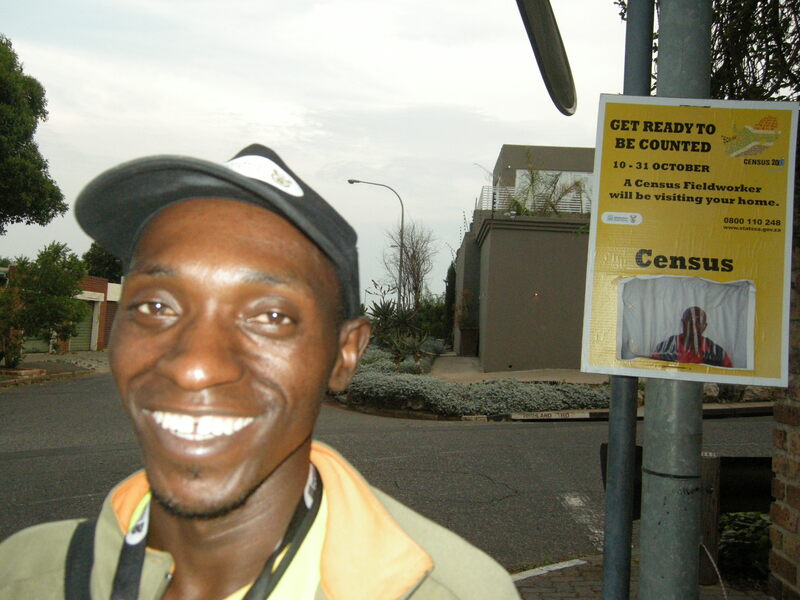 The posters were just one of several security measures, introduced by the organisers of Census 2011. The idea is that the home owner could compare the photograph of the census taker on the poster, to that of the person who had arrived at the door. In crime ridden Johannesburg, South Africa, you can’t be too careful. Festus arrived with a quiet knock at the door. He showed us his identification card, and we took him into the kitchen where the questioning began. When my ancestors answered the knock 100 years ago, all they had to do was accept a form. Now the census man, could ask up to 75 questions, and the process take as long as 40 minutes. Festus asked about income, the type of house we lived in. He even wanted to know if we owned a vacuum cleaner. Does anyone in this house suffer from mental illness?” he asked. “journalisme”. We recognised the French. “I’m from Rwanda,” he explained. He is part of a small group of foreigners enlisted to be census takers for October. 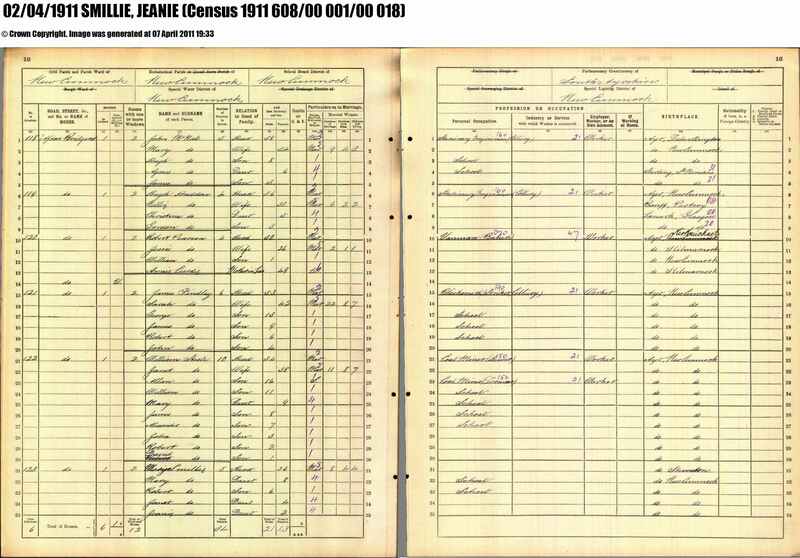 A hundred years ago, when the census man arrived at my great grandfather’s house, it was unlikely he was a foreigner. They might have even known him. Perhaps he was the local school master. On April 2,1911 approximately 9000 enumerators fanned out across Scotland distributing household schedules that had to be filled in by the head of each household. They later collected the household schedules, which were then used to compile the enumeration books. What was recorded in those enumeration books, was kept secret from the public for 100 years. The reason? Scottish privacy laws. 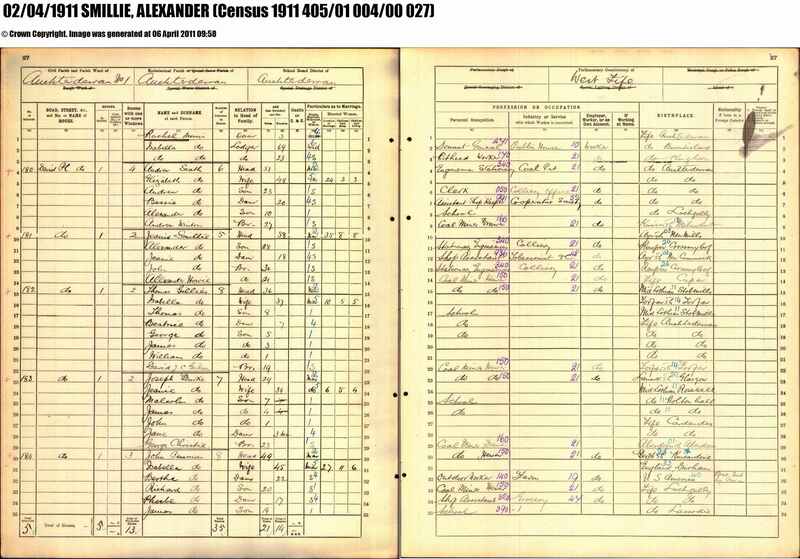 On April 5, Census 1911 was released on the internet. But where there should have been one enumeration form for my ancestors, there were two. Here was a family mystery. In a place called New Curmnock, in western Scotland, the census man recorded my great grandmother as the head of the family. She was there with her four children. This census form has Mary Smillie as the head of the family and as married. But where was my great grandfather? He pops up in Fife 120 kilometres away. John Smillie was staying with his mother, whose name the enumerator recorded as Jeanie, which was her middle name. John on the census form was ticked as being single. My great grandfather had married in 1902. Was it an error or had my great grandparents separated? Mary, my great grandmother, recorded her status as married. They might have been apart for economic reasons, perhaps Fife was where the work was. It could have just been a simple visit. It is a mystery unlikely to be solved. The reasons why my great grandfather and mother were apart in separate households has slipped from living memory. The only person I knew in that census record was Mary Smillie, then a girl of 8. Great aunt Mary used to write letters and send Christmas cards to me, until her death in 1983. I never met her, for she lived in Scotland. She perhaps would have known the reason. If it was a separation, there was to be a happy ending. One person missing from the Scottish census of 1911 was my grandfather. He was born seven years later. They had to have made up. My great grandparents were to remain together until their deaths in the early 1960s. 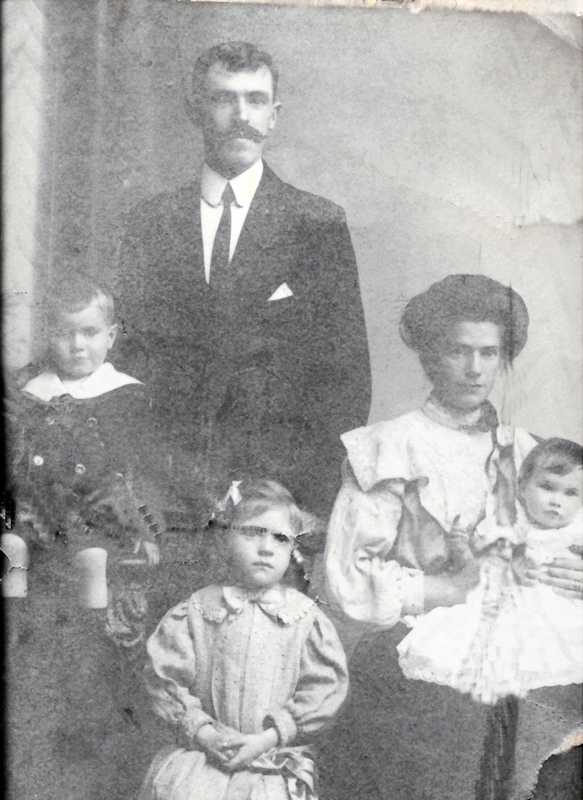 This entry was posted in Smillie family history and tagged Census, Fife, Johannesburg, Scotland. Bookmark the permalink.